SANTA CLARA, Calif. – Doug Baldwin doesn’t do ties. Not on the scoreboard. Not in the Seahawks record book, either. Seattle’s often-intense, No. 1 wide receiver had two catches on Sunday, including a leaping, 41-yard reception in the second quarter that finally got the offense going on its way to a 25-23 victory at San Francisco. Baldwin finished his first regular season since signing a $46 million contract extension with a career-high 94 receptions. That tied Bobby Engram from 2007 for the most catches in a season in franchise history. What’s that mean to Baldwin? “It means I was one short of owning the record,” Baldwin deadpanned with a slight nod of his head while he sat at his locker at Levi’s Stadium late Sunday afternoon. Baldwin’s seven touchdown catches this season were half of his league-leading total from 2015. That was more a function of the Seahawks offense being inconsistent as a whole, of quarterback Russell Wilson playing from mid-September into late November with a high-ankle sprain and sprained knee ligament – and of the offensive line often struggling to give Wilson enough time to find Baldwin coming out of his route cuts. Still, 94 catches is tied for most in the 41-year history of Seahawks football. For Baldwin, the more important number on which he expanded – a little bit more, anyway – was 10. That’s the number of wins the Seahawks (10-5-1) have reached or surpassed in the last five of Baldwin’s six seasons with the team. 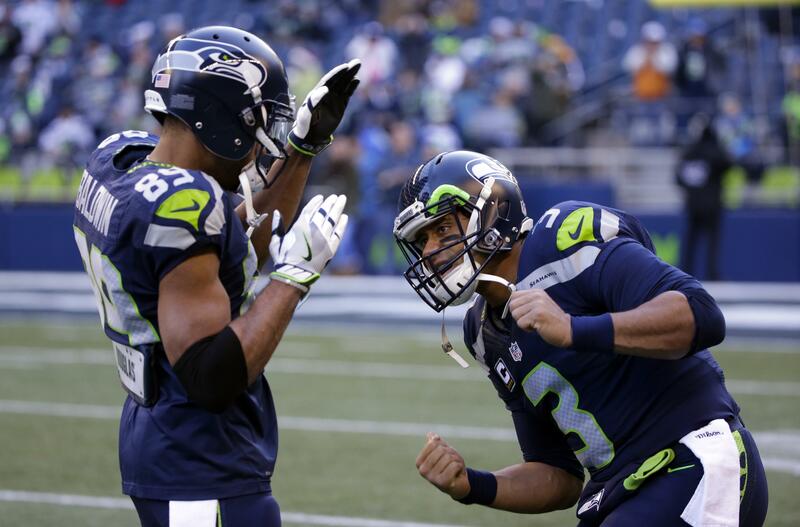 This is the first time the Seahawks have had five consecutive seasons with 10 or more wins. In fact, the Seahawks never had consecutive seasons with double-digit wins until Pete Carroll arrived in 2010 and the winning began in ’12. This season it meant the third NFC West championship in four years, and a third seed in the conference for the playoffs that begin Saturday at CenturyLink Field. “Another 10-win season. That’s obviously huge,” Wilson said. “We think about 10 wins every year, or more, and that’s not easy to do in the National Football League. “I think it comes down to consistency. It comes down to hard work, players playing for one another. Our coaching staff is unbelievable. We believe in them, and having the best fans in the National Football League. As rocky this one was, another 10-win season was Carroll’s primary message to his players in the locker room following Sunday’s win. “Well, we got done what we had to get done today: We got a win, got out of here,” Carroll said. “And I’m real proud of the statement of winning 10 games for five years in a row. I think that’s pretty darn good, 10 or more. Published: Jan. 1, 2017, 10:04 p.m.